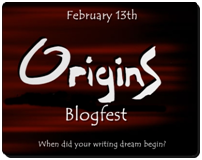 Today I am taking part in the Origins Blogfest in which participants blog about when their dream to become a writer began. I've scribbled down bits of stories from as far back as I can remember. In fact, my dad once did a (now very embarrassing) video recording of the family and on one clip I am tracing and copying the words from a book I had brought home from school when I was around 5. I can remember the book - it was about a bear who puts his clothes on the wrong parts of his body. I wrote my little stories and hid them away so my brothers wouldn't laugh at them. They did find the stories. And they did laugh. But it wasn't until I was around ten when it occured to me that I could be an actual author when I grew up. One of the teachers at my school (Mr Perrin - best teacher EVER) took his class and the class I was in to our local library to listen to a talk a children's author was giving. I sat there, listening to this man talk about his ideas book and how he based one of his characters on a boy he had listened to in the dentist's waiting room and I thought this is it. This is what I want to do. I got myself an ideas book of my own (an old school notebook) and it has been my dream ever since. I haven't actually reached that dream yet as the only work I've had published is a poem about a fox in an anthology where pretty much everyone who sent a poem in made it into the book. But I'll keep trying. It would be nice if it was a teeny bit easier, wouldn't it? I wish I could remember the name of the children's author. Everything else is so clear but it never occured to me to remember his name for twenty years down the line! It's wonderful when you listen to (or read about) an author talking about his/her work and you think -- this is what I want! I absolutely love your origin story. How wonderful to sit there and listen to an author share his thoughts and feelings on his own writing, and realize that's what you want, too! Isn't it the coolest thing to hear writers talk? I also love reading their biographies. Nice to meet you via the fest! Hi Mama J! I'm just stopping by as one of the co-hosts, and am now your newest follower. Nice to meet you! How cool that you got that moment on video. Wish I had one of those early writing moments on tape too. Great to meet you through this blogfest! Hurray for inspiring teachers! I've seen a few posts in this blogfest where people were inspired or encouraged by something a good teacher did or said. Thank you all for visiting my blog. I appreciate all your comments :-) It's been great reading other writers' stories and meeting new people.